Fresh artichokes are in season in the northern hemisphere. They look funny and take a certain amount of effort to prepare, but if you make a few at once it’s worth it. Here’s the video I made explaining how to prepare artichokes for cooking. Artichokes are a classic food for pressure cookers because they cook so quickly, in about ten minutes, while retaining their color, flavor and nutrition. I saw a recommendation for cooking them individually in the microwave, if you don’t mind wrapping each one in plastic. I bet you could do it without the plastic too. Or steam or cook in a conventional pot for about thirty minutes. They are ready when you can pierce the heart easily with a fork. 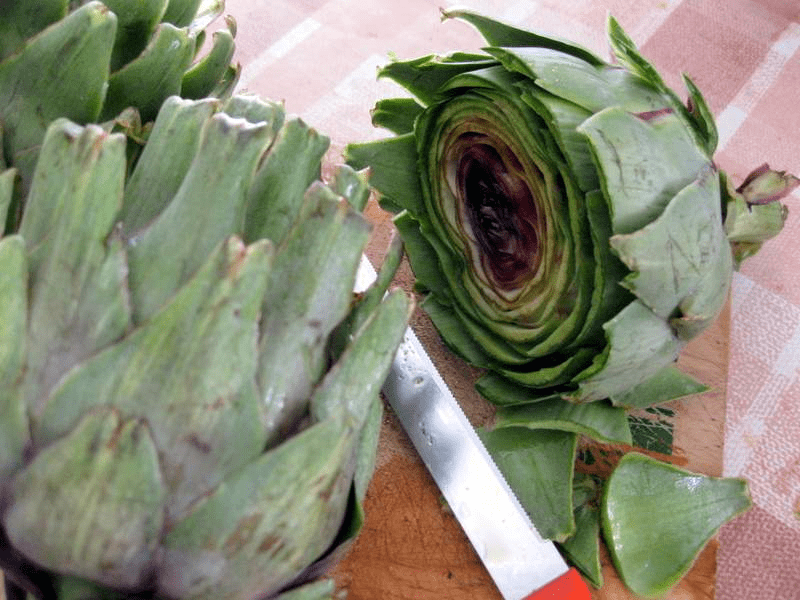 The heart is the flesh of the artichoke, between the leaves and the stem. To eat, dip artichoke leaves in mayonnaise or any kind of salad dressing. Scrape off the tender part at the bottom of each leaf with your teeth. Eat the heart with the dressing or cut it up for salad, but don’t forget to remove the spiny leaves in the center. I love artichoves, but the ones I bought last week at the shuk had a faint hint cigarette flavor. Hi Hannah, I have missed you. It’s true that some are very fond of microwaved artichokes. I tried it a long time ago and went back to cooking them in water. They seemed a bit too bitter to our taste when microwaved. It’s good to drain them upside down after cooking. The stem of the artichoke is good too. After you cook it you can cut off the outer layer, and the part inside tastes like the artichoke heart. My family have all adored artichokes since they were small children. I think that it is partly because the season here for good ones is short and as I don’t buy them very often so they are considered a treat. My childrens’ elementary school English teacher once told me that when she asked them to fill in some questions about themseles, each of them (at the age of 8 or 9) answered ‘What is your favourite food?’ with Artichoke. She found that strange. Sue, my 7yo daughter announced today that artichokes are her favorite vegetable. She and I are the only ones in the family who eat them! Another reason for the popularity of our artichokes is the very tasty tartare sauce that I serve them with. Let me know if you’d like the recipe. I test if they are cooked by pulling off a leaf or two. If they come away easily, they are done. I think that is easier than pulling one out to pierce the bottom, but that is a case of individual preference. Sue, I would like the recipe, and your idea for testing doneness is good too. Fried artichokes Roman style are excellent. Probably the best tasting artichokes I’ve ever had.